Membership is making a covenant commitment to a particular people to partner to grow and serve together for the glory of God. 1. Be a Baptized Believer in Jesus Christ. We want to hear your testimony and how Jesus Christ has transformed your life. We want to hear how God has saved you by His grace. In addition, we require that you be baptized as a believer in a like-minded church. 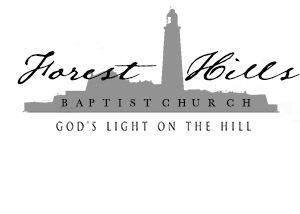 If not, Forest Hills will present you as a baptismal candidate to be baptized in one of our services. 2. Agree with the Doctrine and Theology of Forest Hills Baptist Church. In order to be a member we require you to agree with our doctrine and statement of Faith. We hold to the Baptist Faith and Message 2000, which is a statement of faith laying out the doctrines we believe. We require that church members hold to these theological beliefs and teach and live by their truthfulness accordingly. 3. Submit to the Spiritual Authority of the Pastors and Leadership in the Church. As a congregational church, every member has a voice in selecting and affirming the leadership of the church yet, we ask that the membership affirm and subject themselves to the leadership of the church. They are the authority God has placed over Forest Hills Baptist Church for the good of the people and for the glory of God. Again, they are those who must give account to God. Set up a meeting with our interim at Forest Hills Baptist for an interview. Be presented to the church in a Sunday Morning during the invitation for membership. If you have any questions about membership at Forest Hills be sure to contact us below.